I wish I could say former Fed Chair Alan Greenspan was just senile and let it go at that, however, his sort of thinking is embraced by the Ruling Class as the Obama regime looks to start a third round of quantitative easing, [QE3] something Governor Sarah Palin recently talked about. Of course Greenspan is right. The United States Treasury can print money until it exhausts the world's paper and ink supply. There's just one problem: Hyper-inflation. As we have seen with the Obama regime's QE1 and QE2, inflation is already hurting the economy significantly. Food prices are up, hurting the nation's poor the most. Part of the increase in gasoline prices is a result of monetizing our debt. As insane as Greenspan's statement sounds, those in control of monetary policy are getting ready to do just as he suggests.Print more money. QE3 is coming. It's obvious our "betters" slept through history class or they'd have learned exactly where they have us headed. If only the nation's "thought leaders" had studied Germany's Weimar Republic from the 1920s [or even modern day Zimbabwe] they would see the writing on the wall for the United States if we continue down this path of irresponsibility from our government. 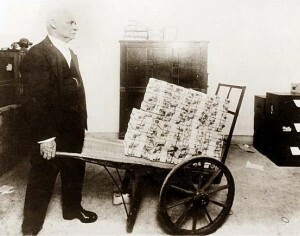 We've all heard the stories of needing a wheelbarrow full of worthless German money to buy bread. But the real disaster of the Weimar government's money policy, it's real legacy, is the rise to power of Adolf Hitler and the Nazi Party. The monetary policy collapsed the government and the Nazis filled the void. I'm firmly convinced Barack Obama is using the Cloward-Piven strategy of manufactured crisis and fully intends to bring about the collapse of American society in order to bring about radical change. Change that would destroy the very fabric the nation was created from. Obama has called the Constitution a flawed document filled with "negative rights." What Obama means is the Constitution was written to restrain government. To restrict what government can and cannot do. Totalitarians like Obama can't stand this as it doesn't allow them to create a command and control central government that rules every aspect of the citizens' lives, while at the same time making their cronies rich beyond their wildest dreams. Obama and the Fed must be stopped and stopped now. We don't have time to wait for 2013 when a new President will be sworn in. Call Congress, get involved. Do.It.Now.